The Full Moon that will rise at sunset on September 7th is known as the Harvest Moon. Watch for it this week and you’ll see it do something special. Technically, the “Harvest Moon” is whatever Full Moon rises closest to the Autumnal Equinox (which is September 22 or 23), so it could happen in either September or October. On average, the Moon rises about an hour later every night. But near the Equinox, this delay drops to about a half hour. As a result, we find the Moon rising very near sunset for a few days in a row, staying up all night, and setting at sunrise. You should know that any Full Moon will always rise near sunset, and set near sunrise, but why that happens is a topic for another column. The Moon’s path through the sky also changes. Sometimes it takes the short, quick route. 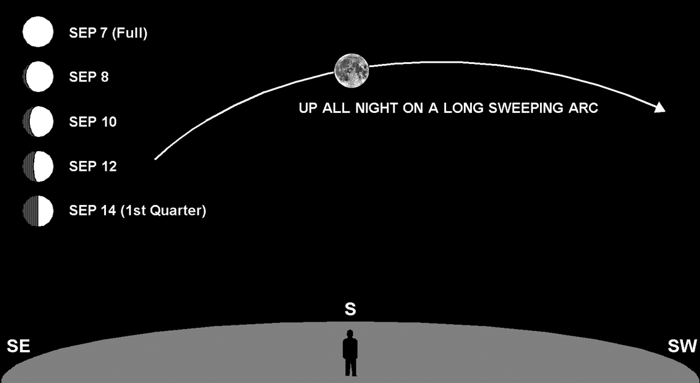 Other times, as around the Equinox, it follows a longer sweeping arc. These seasonal changes in the Moon’s rise time and path are caused by the 5° tilt of its orbit relative to Earth’s orbit. Bright moonlit nights are convenient for farmers who need to bring in crops this time of year, and might choose to work into the night. Hence the “harvest” designation. The Harvest Moon usually looks larger and more orange when rising. The size change is an optical illusion. When the Moon is visually closer to tiny distant objects on the horizon, it just seems larger by comparison. The color change is real, and caused by moonlight scattering off the larger particles of dust found lower in the atmosphere. The same thing happens with a sunrise or sunset, or, for that matter, a moonset. Can You Find the Milky Way? Previous Previous post: Can You Find the Milky Way?